Strategic hiring involves increasing your hiring speed. One of the best options for adopting a more strategic mindset involves building a deliberate recruiting plan. If you can lay your hiring foundation down prior to posting your initial job opening, you’re already ten steps ahead of where you would be without strategic hiring methods. Begin by determining the characteristics or behaviors that you think your ideal candidate would possess and then design a strategic job ad that appeals to these types of personalities. Remember, that being a strategic thinker always begins and ends with the big picture, so create a job ad that advertises what’s in it for them (the job seeker) just as much as detailing what’s in it for you. Design a strategic employer brand. Having a well-established and deliberate employer brand is important for all strategic HR professionals, but even more so for HR professionals working in the non-profit area. Being strategic about how your applicants perceive you can help you attract quality job seekers when your budget is limited. It also helps bring people to you who will align with your company culture – for non-profits, this couldn’t be more beneficial because your image and the ideas you promote is a fundamental piece of your success. Strategic hiring should be proactive, not reactive. I know, I know…in a perfect world, we’d all be devoid of tight deadlines, so we don’t have to make impulse decisions that are likely going to hinder us later on. Except, we don’t live in a perfect world and deadlines are the pulse of business in a technology driven world. That being said, it’s nearly impossible to be strategic about hiring when you’re in pure reactionary mode and simply trying to fill seats without focusing on the long-term. Remember the golden rule mentioned earlier? Look at the big picture. While you may not be able to control being placed in a reactive situation, you can take a step back and assess your choices and their impact with strategic problem-solving in mind after the dust settles. While this assertion feels like “no-brainer” advice, it’s not uncommon to survive the stress of filling a lot of positions quickly and then wanting to decompress for a couple weeks afterward. Unfortunately, your strategic insight will be most reliable during the chaos or directly after the chaos’s climax, so figuring out a plan that is better aligned with your big picture should happen at this time. Conduct strategic research regarding your competition. Researching your competition is one of the most important channels for gathering strategic hiring information. What many HR professionals don’t understand is that hiring competition isn’t simply limited to non-profit companies or organizations in your industry. When you post a job opening, you’re competing with any business that recruits a talent pool that possesses a similar skill set to your ideal employees. If you’re hiring for an entry-level position, then anyone who is hiring for entry-level positions has the potential to absorb employees that would be a good fit for you as well. Conduct some strategic research about your recruiting competition by looking over the job ads – their benefits, their culture, their salary, etc. and use that information to design a more appealing job ad. Want to see how your strategic hiring insight measures up? 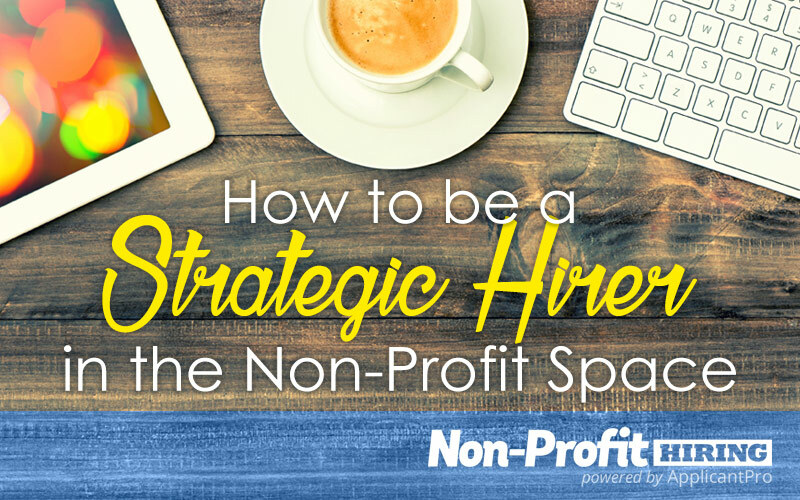 Our non-profit hiring experts can help! Give us a call for a free hiring assessment, today.